Are you a hoarder? Do you have a regular de-clutter or are your cupboards bulging with ‘stuff’ that you might need one day? I felt like I’d grown up when the dustmen finally added our address to their round and could take away all the recycling that used to fill our sheds, but we seem to have replaced the empty space with junk. Mr G and I are shocking hoarders, partly because we have sheds that we can move all the toot into once it’s no longer needed indoors and partly because we might need it one day. While I’ve always been fairly good at giving away clothes that our children have grown out of, I’m afraid toys and other junk are another matter. Despite our youngest approaching her twelfth birthday, we still have Telly Tubbies and Tweenies in boxes waiting to be sorted and sold and I’m sure I spotted a Thomas the Tank Engine ticket office buried deeply out there when I was looking for seed trays recently. During the New Year festivities we were making plans for the months ahead and decluttering was high up on the list. There must be a child somewhere that would love a little playhouse of their own and maybe if the Tree Change Dolls woman wasn’t so far away she might like to turn a Bratz party bus into a camper van for her growing collection of fabulous revamped, au naturel dolls? With the promise of spring I’ve stuck my head into the potting shed once again which I’m now sharing with the stack of ‘temporary’ boxes of stuff. 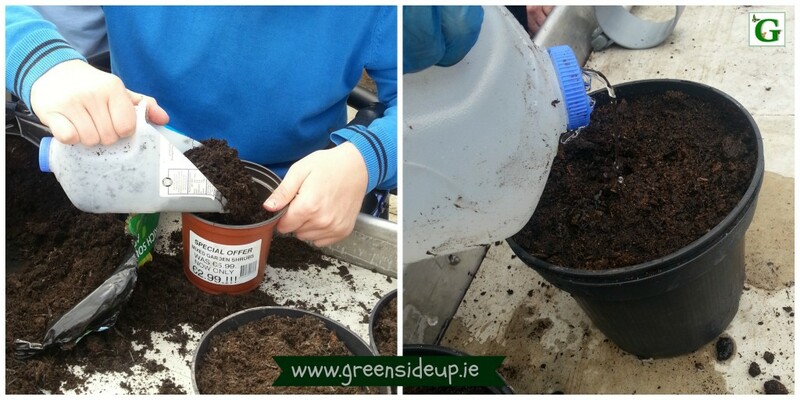 Last year I ran a six-week course funded by Local Agenda 21 Partnership funding for the local Irish Wheelchair group, Growing Vegetables in Recycled Containers where the group were encouraged to look at their rubbish a bit differently. If it once contained something, could it be used again to hold compost and grow food in? I showed the group my Pinterest board that contains a few ideas and fair play, they got creative. 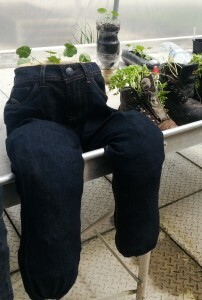 They weren’t convinced they would like to eat food out of a container that had once held a pair of smelly feet, so we opted to pop some companion plants into the boots, and the jeans were a genius piece of fun and talking point. I’d love to have seen them in full bloom. Some of the ideas we’d seen online and wanted to see if they worked, like the milk container that could be turned into a watering can or a compost scoop, both of which worked brilliantly. The 2 lt drink bottles were pretty cool too once washed, labels removed, drainage holes made and filled with seedlings instead of their previously unhealthy occupiers. I’m due to do a couple of talks about growing vegetables in recycled containers in the coming months. 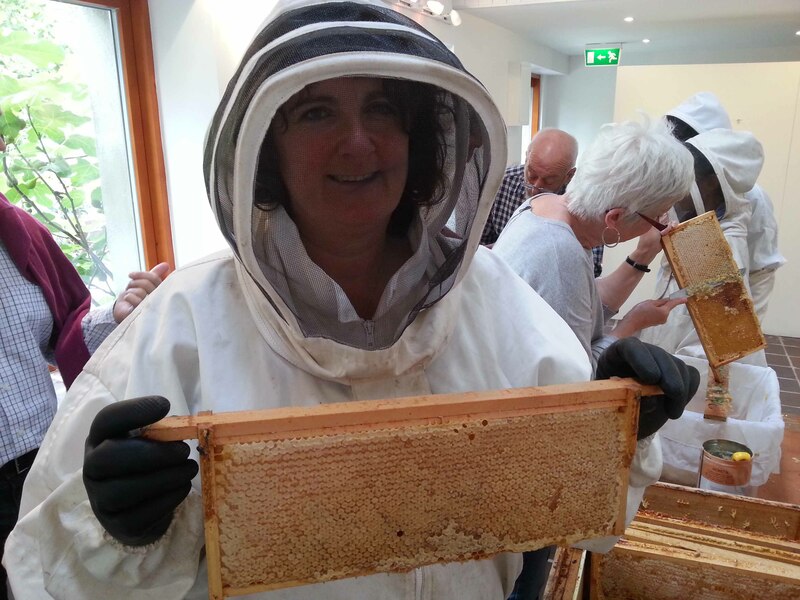 One live streamed around the offices of the Environmental Protection Agency and another at the Rothe House Garden Festival in Kilkenny in June. With these two events on the horizon I’ll be looking through the containers in the shed to see if there’s anything in there that I can take along. As long as drainage holes can be made in a container, we can pretty much use anything to grow food or flowers in it, toxic materials excepting. Growing food in junk is a great way of beginning to grow your own vegetables. If you’re worried about the initial outlay of pots, compost, seeds, tools etc., immediately you’ve eliminated one of the costs and once you begin, it makes you much more aware of all the packaging our ‘stuff’ comes in and you may find yourself trying to reduce it as a result. If you’d like some more tips about growing vegetables in containers of any description, check out this article. Are you a hoarder or are you super efficient with your old junk? Have you any tips to help someone like me who can’t throw anything away? Whilst I do start off my runner beans in loo rolls, I’m pretty good at chucking other stuff away. I donate any clothes that are good quality to the charity shop and give away 95% of novels once I’ve read them. Bits of boxes and card go in the compost, as do the usual scraps, egg boxes and teabags. The shed is another matter – I can’t stop my husband from saving things just in case! Those jeans look good! Love the idea of planting in things like those plastic bottles and yes, I like the boots too. I’m a hoarder too, esp with books. The school is having a book sale again and I will have a look through and donate some but when I look at a book, even if I haven’t read it for ten years, I remember where I was when I read it and how I felt etc. I wished I’d ask for photos or called back when they were in full bloom Lorna 🙂 Books are my worst, exactly for the reason you mentioned plus I enjoy re-reading them occasionally. Good luck with the book sale sorting! Great suggestions Dee, and a good post for anyone who thinks they need to buy loads of stuff to start gardening 🙂 Also love the jeans.